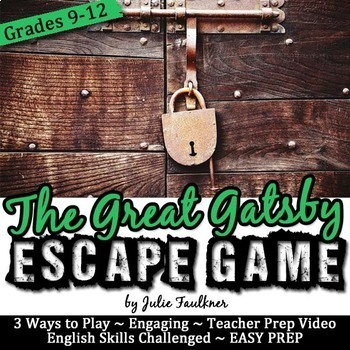 Get ready to dive into an exciting escape-room style adventure with this break-out game designed to review narrative elements in Fitzgerald's The Great Gatsby with secondary students! 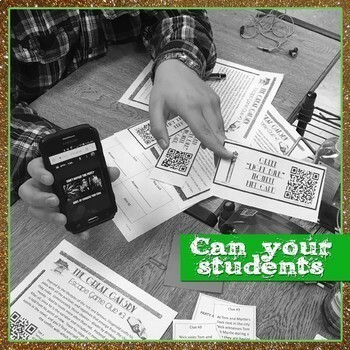 From the most reluctant learner to the most advanced, all of your students will be 100% engaged in solving the clues in this interactive lock box game for reviewing fiction. Plus, you'll be on the cutting edge with this educational teaching trend that will be exciting and purposeful in classrooms for years to come! 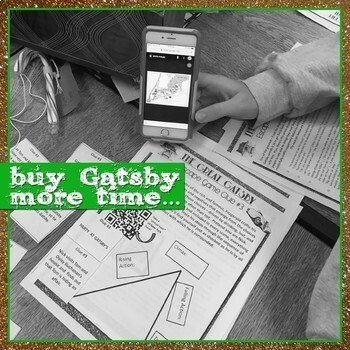 Student Experience: In this escape game with a flexible three-ways-to-play format, students must work to solve the clues in order to buy Gatsby more time before his dreams are lost forever. Students will review include plot, characterization, key quotes, info text reading, irony, and symbolism. Your students will love the exciting, modern game-like format. You will love that your students are actually enjoying reviewing the elements of fiction. Your admin will love to see that you're engaging all learners with higher order critical thinking and problem solving. My students were bubbling with excitement and energy the entire period! Are you ready to UNLOCK THE FUN?!?! 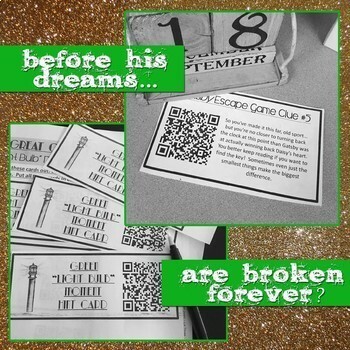 *Requirements for the game no matter which way you play: Smart devices with QR scanners and Internet access. Access to youtube.com. ♥ "Julie's escape boxes are awesome! It does take a little time to set up and get ready for your class, but I cannot imagine the time it took her to make the clues etc! My students absolutely love this activity. (We have 45 minute classes, so sometimes it has to carry over to the next day. Wish I could keep them longer on Escape Box days!)" ♥ "This seller seeks to create innovative lessons that truly engage learners. I have personally reached out, and she responds with great empathy. This resource is great, and the seller highly recommended!" ^^Using a physical lock box might make you a little apprehensive. No worries. Take a quick glance at my free video tutorial. Click Here.